Although the MBK Booster is the popular scooter model in France, we did not a whole lot of work on it until 2011. Time to change that, we decided. After the custom job done on the Boost Executor 180cc (1990) our MXS Racing Team now took Booster 2004 and turned it into a rocket. 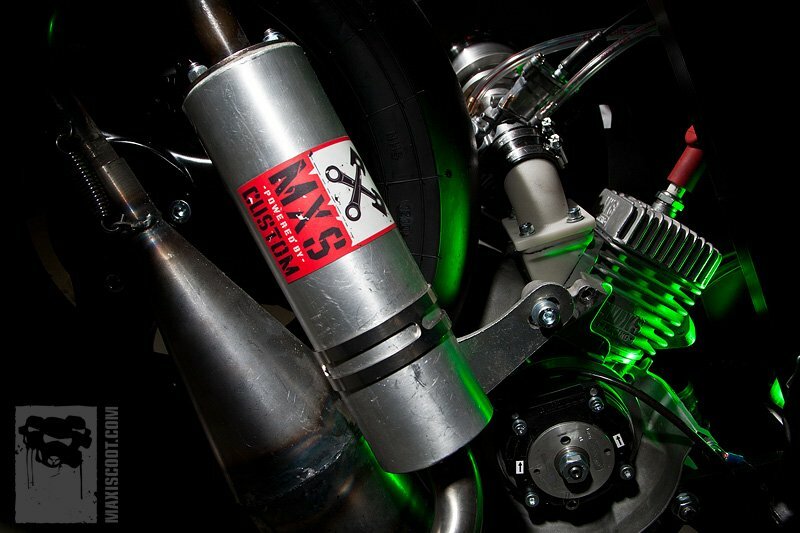 Just like for most of our custom builds we used a custom-made aluminium frame as a base for the Booster MXS Racing. In order for the fairing panels to fit properly in the end, frame dimensions have to be identical to the original, otherwise you’re in for a surprise. 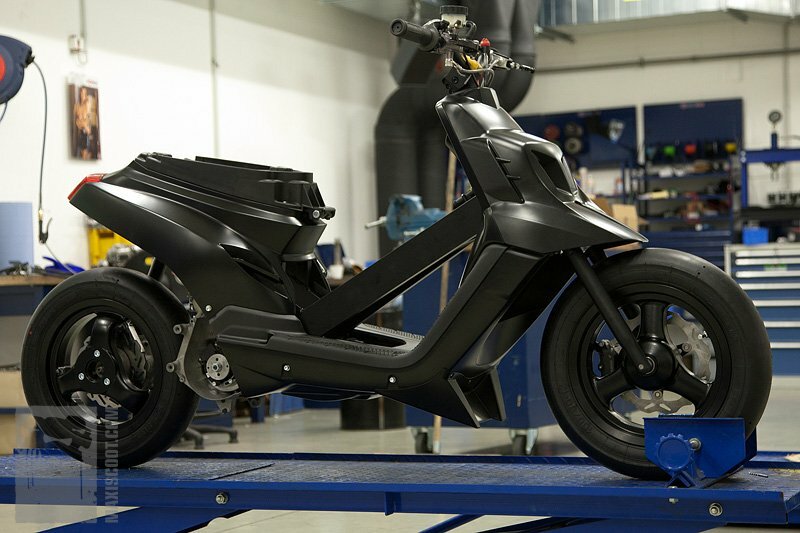 Once the the welding part was finished, the frame was painted matte blacke. We then added a billet aluminium triple tree by Voca and two fork tubes cut from one piece in front, all of these parts were painted matte black as well. A rigid rod links the frame to the motor at the rear. We opted for Malaguti F12 rims plus Stage6 slicks 100/90-12 to optimize the balance between weight and handling / traction. 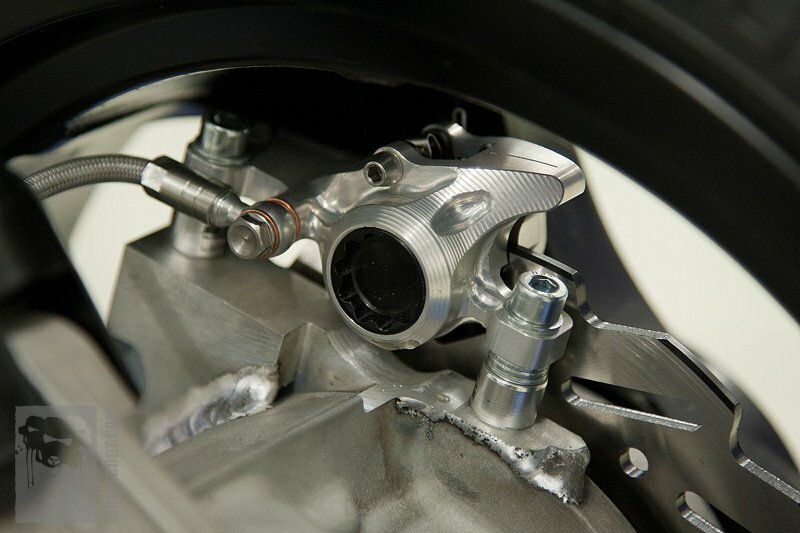 We picked a Galfer brake with Oversize brake disc (with 220mm diameter) and 4-piston brake caliper to maximize stopping power at the front wheel. For the rear wheel, we went for a 190mm brake disc by Stage6 and a Hope Moto brake caliper mounted on a custom made aluminium holder plate. For the cockpit (handlebar and handlebar clamp), we decided to use high-quality BCD parts. The rather subtle and clean look was then enhanced and given a sporty edge by adding STR8 side panels that were also painted matte black and covered with custom designed MXS Racing decals. You can see that we also modified the headlight mask to give it a more aggressive racing look. 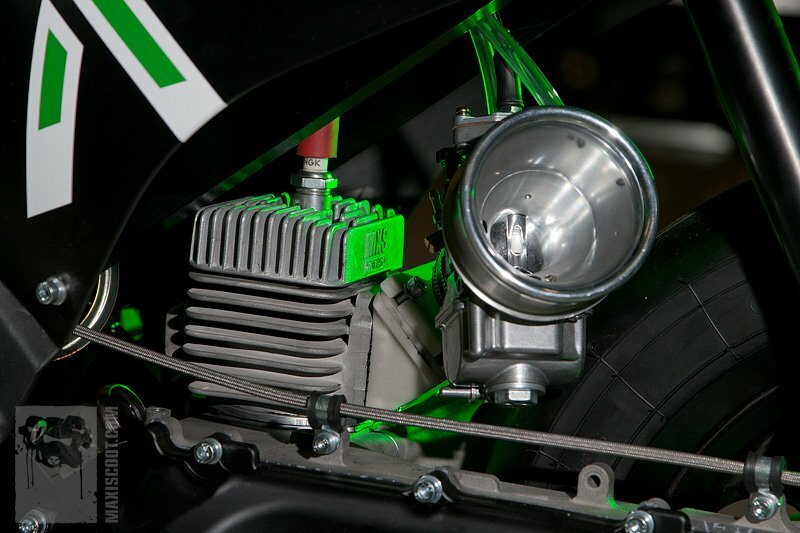 Let’s now take a look at the centrepiece of our custom build, the engine, because we did not take on the project just to make it look pretty, but to turn it into a competitive drag racer. We decided to buck the current trend to do an engine swap Nitro motor to Booster frame (the result is called Spitro in France) and instead to keep the plenty of the original Minarelli vertical parts and simply combine them with our extremely powerful MXS Racing 70cc cylinder. Afetr several rounds on our P4 test bench and the resulting re-adjustments and optimizations, the MXS enhanced Booster now delivers a whopping 22 hp at the wheel (21.6 hp to be precise). If you’re interested, check out the amazing power curve. And its curb weight of only 47kg means that our Booster custom build means serious competition on the racetrack! 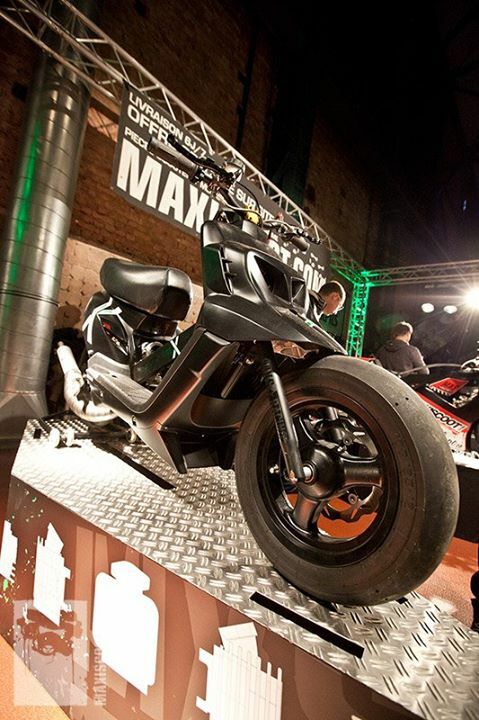 The Booster MXS 70cc is a 100% drag bike built for racing; you can see it and many other MXS Racing projects at the Maxiscoot stand at the custom show. If you like our Booster MXS Racing dragster and would like to see more pictures of our custom builds, just have a look at our online magazine.